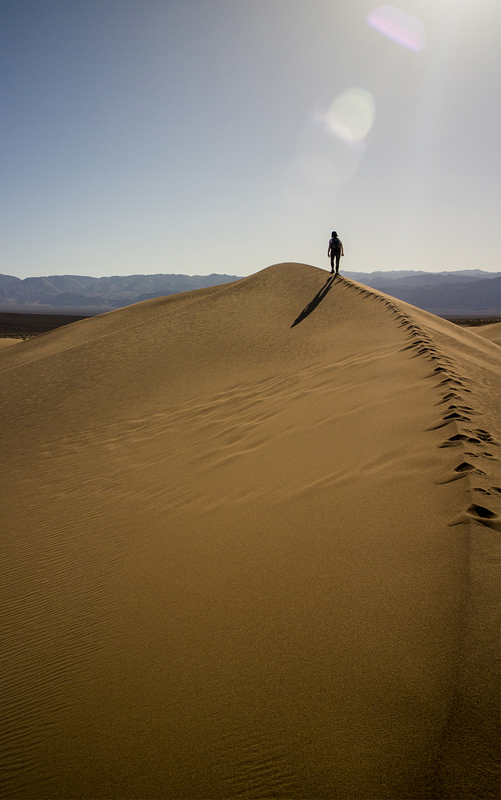 If I had to choose one word to describe Death Valley National Park, it would be sharp. The sharpness of the light piercing skin like thousands of tiny needles until all exposed flesh oozes pink. The sharp heat reaching in through the pores and sucking away all life sustaining moisture. The sharp edges of mountain ridges, a serrated knife cleaving the earth’s crust as it slices toward the sky. The cutting spines of volcanic rocks scattered over a landscape that has more strewn rocks than plants capable of grasping a tenuous foothold in the slivers between the stones. The sharpness of silence that, given time, cuts through all internal noise until one is flayed and able hear your blood roiling in the veins. The sharp focus obtained while lying still on a sand dune, the only softness available for miles save the wispy clouds floating silently overhead. Irene and I trudged across the sand dunes for what seemed an eternity in our quest to find the perfect spot to relax. How does one find the perfect spot? The reality is the perfect spot draws one to itself. It’s a spiritual connection with place that fills a puzzle void unique to each individual. What works for me won’t necessarily work for Irene or anyone else. And where I connect today won’t necessarily be the same tomorrow because existence is ever changing. As soon as I felt that connection to a spot, my spot, I stopped and immersed myself for contemplation. Irene, meanwhile, continued to explore the sharp crests and smooth valleys of the dunes enjoying solitude in her own way. It took a few minutes for me to settle comfortably into the dune. A few more to disconnect from time bounded life. Then quite a few more minutes until my thoughts became intimate companions instead of flashes at the corner of my minds eye. I lay in those sand dunes letting the surrounding sharpness do it’s work. I lay there allowing my thoughts to grow to shrink to morph to disassemble and reassemble into new thoughts. I lay until I could feel my thoughts breathe of their own accord, become living entities, will filled beings. I lay until conscious thought became unconscious existence, a meditative state, wherein my unconscious thoughts broke free and began to roam outside my body. At first, they didn’t travel much beyond the nearest sand ridge before scurrying back. Soon, set free, my unconscious thoughts began to roam further, to explore, to discover. I watched them crawl beneath the rare plant and ride on the wings of the winds. I watched them venture further, watched them wander in and out of the canyons where they explored the lengthening shadows formed as the sun cut an arc through the cloudless blue. When out of site, I could hear them bouncing off the canyon walls in descending and ascending trills. Becoming. Seeking. Death Valley is a space so vast they could explore a lifetime without encountering other thoughts, other sentient life forms. Though apart from my body, I could feel my thoughts congeal then disperse and reform anew. I could feel them bouncing off the rock walls. I could feel them cut themselves on the volcanic rock and bleed. They bled in red, they bled in blue and green and yellow and orange and in colors absorbed from the minerals forming the stone walls. As the dark slowly covered the land, I watched those thoughts generate light in the same colors they bled. I watched then ascend heavenward. Slowly at first, then quickly until they became indistinct from any of the stars in the night sky except for their richness of color. They pulsed in time with the twinkling white stars reaching out from distant galaxies. It soon dawned upon me that each dot of light of light represents a being like me sending thoughts from it’s own universe to other universes billions of miles distant. I felt comfortably connected knowing we are not alone in the universe. 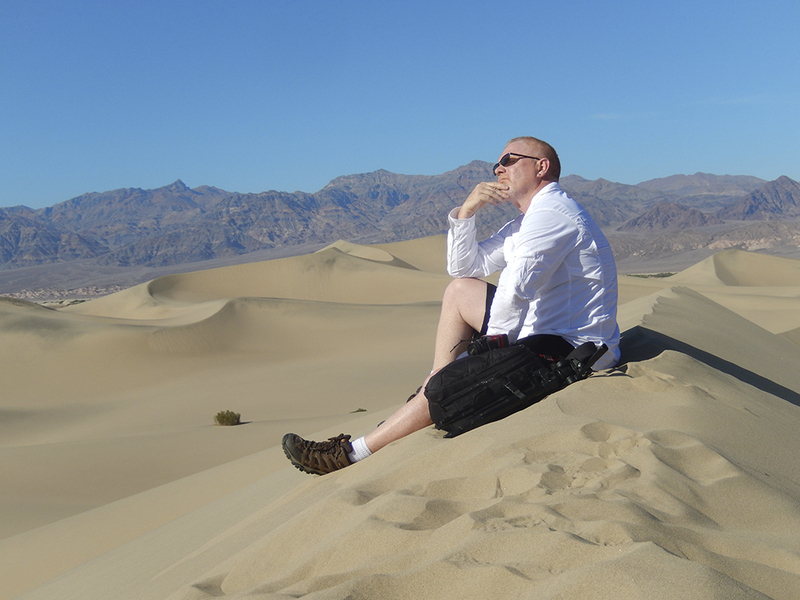 This entry was posted in Adventure, Exploration, Explore and tagged Death Valley, Sharpness, Silence, Thoughts. Bookmark the permalink.